MTBE Plume Remediation - Noreas Inc.
NOREAS performed remediation system installation, groundwater monitoring, remediation system operation & maintenance (O&M), and reporting at the Area 62 Gas Station on (Site 62507), Marine Corps Base (MCB) Camp Pendleton, California. The groundwater plume at this site is comprised of diesel fuel and gasoline, VOCs (including BTEX), PAHs, and fuel oxygenates (MTBE and TBA). ISCO had been conducted previously at the site to treat MTBE with marginal success. 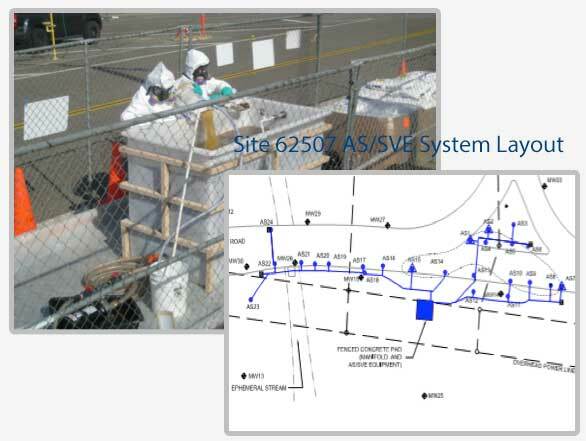 Based on the success of a similar system used in another area at the site, NOREAS installed a new AS/SVE system at Site 62507. The new system consists of 24 sparge wells, with soil vapor extraction wells installed within the same borehole, located within the MTBE plume. The overall remedial strategy is to use AS/SVE to address groundwater with MTBE concentrations over 1,000 µg/L. The AS/SVE wells and the underground piping were installed such that air sparging could be supplemented with ozone or a mixture of ozone and hydrogen peroxide (perozone), if warranted. Initially, however, the aboveground equipment only included air sparging components. The system is currently operating in a biosparge mode. Initial performance data are being evaluated to assess whether the system should be converted to AS/SVE. If so, performance monitoring for the AS/SVE system will be used to assess the need for and potential feasibility for addition of ozone or perozone. NOREAS also conducted 1 year of O&M and quarterly groundwater monitoring.